We’ve seen solid research and several market scale successes (iCivics and Game Up). Most importantly the conversation in schools has shifted from “Why the heck would I do something crazy like that” to “I have no idea how to do it well.” We have crossed the chasm to the early majority market. That market needs sound advice and guidance on how to move forward. Greg Toppo’s The Game Believes In You is a welcome addition to the canon of books focused on games and learning. Gregg covers the education beat for USA Today. He used that perch to spend several years digging into the current state of the art. Starting as a skeptic he quickly realized that his preconceived notions about games and learning needed radical revision. What he has produced is a compelling case for games as a valuable addition to the learning media ecosystem. He manages that tricky balance of connecting compelling personal anecdotes to solid research. The reader emerges with clarity on the impact implementation is already having on kids and the most promising avenues for future development. Here are two of my favorite passages from the book that demonstrate this connection. Understanding the twists and turns that got us to where we are is important to those entering the field today. Even someone like me who has been kicking around the space for 10 years picked up whole swaths of background that were helpful. 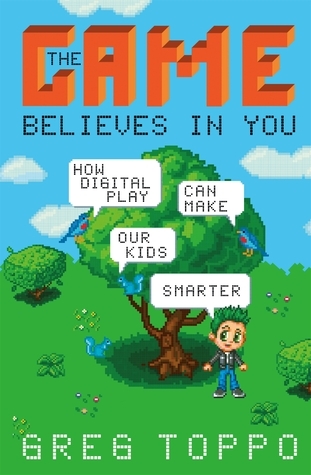 If you are thinking about implementing games in your school or classroom, I encourage you to read The Game Believes In You. The book equips you with the background knowledge to avoid common pitfalls and provides you with examples that will inspire you to push forward through the rough spots. If you are developing games or curriculum materials that use games you will benefit from knowing how we got where we are today, what teachers and students are looking for, and where the puck appears to be moving.